There’s nothing like a ferry journey to give you that holiday feeling and, unless you’re taking your own private plane or yacht, a ferry is the only way to arrive. Step ashore and you’ll feel a world away. The 'Frequently Asked Questions' section of the Isle of Wight’s official tourist website gives a hint of just how strong that feeling can be: Do I need a passport? Do I need foreign currency? Which side of the road do I drive on? The great thing is, because it’s not another country you get the holiday feeling without any of the hassle so the answers are: no, no and on the left! Being off the southern tip of the UK, there’s no surprise that the Isle of Wight has a milder climate than other parts of the country and the southern beach resorts of Shanklin, Sandown and Ventnor are said to be the most sunny spots. An area of Ventnor, known as the undercliff, has a particularly mild micro-climate because it is sheltered by cliffs. The botanic gardens are found in this area with exotic plants that you’d expect to see in greenhouses thriving in the relatively temperate climate. And, of course, all that sunshine makes camping and glamping on the Isle of Wight so much better too. 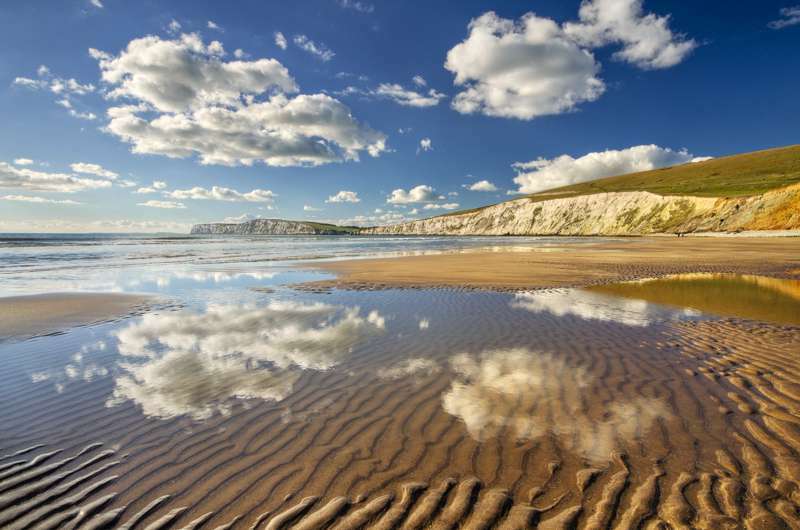 With 57 miles of coastline it’s no surprise that the Isle of Wight has a few great beaches on its shores and, of course, it’s these that have been attracting people to holiday on the island for two hundred years. Whether you like a quiet beach where you can paddle in private or a busy place with the convenience of cafes and crazy golf, you’ll find somewhere to suit you on the island’s seaside. There are Isle of Wight glamping sites with sea views and glamping sites in the countryside but as the island is just 14 miles by 25 miles, you’ll never be far from its beautiful beaches. There have been so many significant fossil and bone finds on the Isle of Wight that Natural History Museum experts dubbed it “the dinosaur capital of Britain”. There’s evidence that 15 different dinosaur species once stalked this part of the country. If you, or your kids, have an interest in dinosaurs you won’t be short on things to do on the Isle of Wight. You can see the remains of some of them at Dinosaur Isle, Britain’s first dedicated dinosaur museum, and perhaps head out searching for fossils on a hunt around the beaches of Sandown – not to mention heading for Blackgang Chine’s more entertainment-orientated Restricted Area Five to see huge, moving models. There are no grey squirrels on the Isle of Wight which means that the red squirrel, Britain’s indigenous squirrel species, rules the roost. The Solent provided a natural barrier to the spread of the grey squirrel, which was introduced to Britain in the late 19th century, and almost wiped out the reds who had been in the country for about 10,000 years. This has made the Isle of Wight one of a precious few places where you can still see these cute bushy-tailed wonders. If checking out the local wildlife is all part of the fun of a camping or glamping holiday for you, the red squirrels might be reason enough to go. By holidaying on the Isle of Wight, you’ll be joining a long list of the notable people who have stayed here – or even moved here. Queen Victoria and Prince Albert chose it for their summer retreat, and Winston Churchill, Charles Dickens, Charles Darwin, Karl Marx, Alfred Lord Tennyson, John Keats and Jane Austen all visited. Surely, they can’t all be wrong! There are various sites linked to some of the most famous visitors which make for a good day out, if you have an interest in literature or history. Osbourne House, the magnificent holiday home of Queen Victoria, Prince Albert and their nine children, is well worth a visit during your own holiday on the Isle of Wight. You can explore all areas of the estate which was the backdrop for much of the 2017 film Victoria & Abdul, starring Judi Dench. Kids will love the Swiss Cottage within the grounds which was built especially for the nine Royal children – but, be warned, no matter how palatial your glamping pad on the Isle of Wight is, it may pale by comparison! Having been a holiday hotspot for two centuries means that the Isle of Wight has developed a fair few attractions to keep visitors entertained. Families are particularly well catered for with more child-friendly attractions packed in to this compact island than seems possible. During a family glamping holiday on the Isle of Wight you can visit zoos and animal sanctuaries like Monkey Haven, ride on the Isle of Wight Steam railway, enjoy traditional seaside fun fairs and entertainment and take a trip to the island’s own theme park at Blackgang Chine to name a few. Home to the world’s biggest and most-famous sailing regatta, Cowes Week, which sees a week of on and offshore entertainment at the beginning of August, the Isle of Wight is well-known for sailing and watersports. Whether you have got your own surfboard or want to test your balance on a stand-up paddle board for the first time, the Isle of Wight is a great place for a glamping holiday with watersports. Surrounded by water and with both sheltered beaches and windswept ones, there’s plenty of opportunity to take to the seas by boat, kayak, kitesurf and more. The Isle of Wight’s chalk cliffs offer a breeding ground for lots of seabirds including fulmar, cormorants, guillemots and razorbills. There’s a small RSPB reserve at Brading Marshes on the east coast of the island and a National Nature Reserve on the Hamstead Heritage Coast on the western side of the island where you can spot wading birds and birds of prey too. It’s a birdwatcher’s paradise – but you don’t have to be a twitcher to appreciate them!